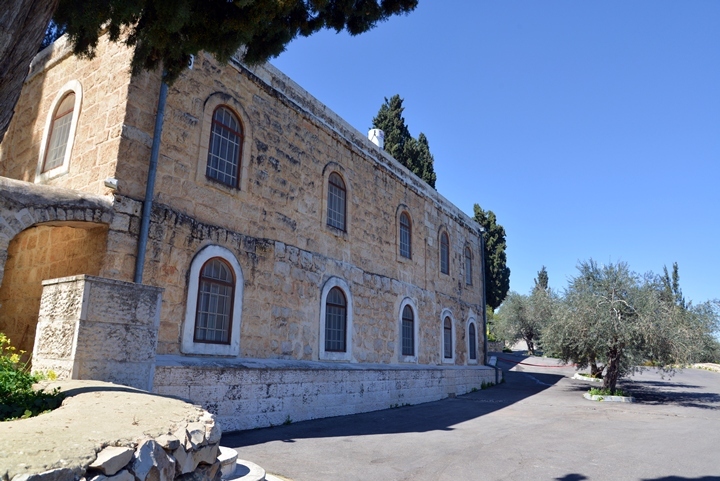 A 19th Century Russian convent, on the south side of Ein Kerem. 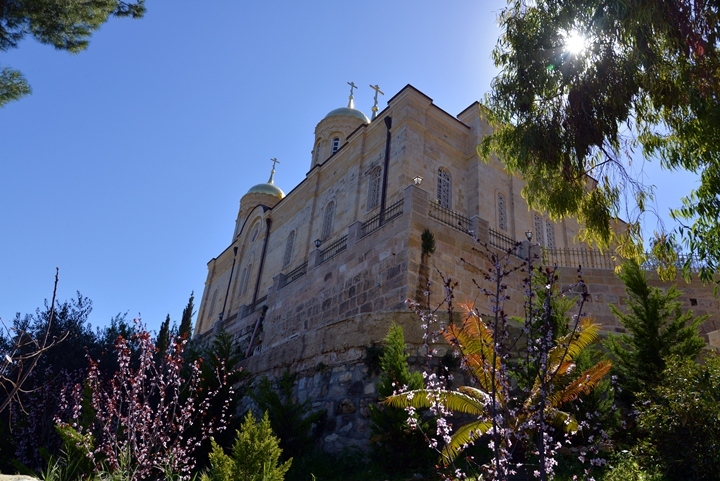 The Russians established a convent for nuns in Ein Kerem during the 19th Century. Its beautiful golden domes dominate the landscape of Ein Kerem. 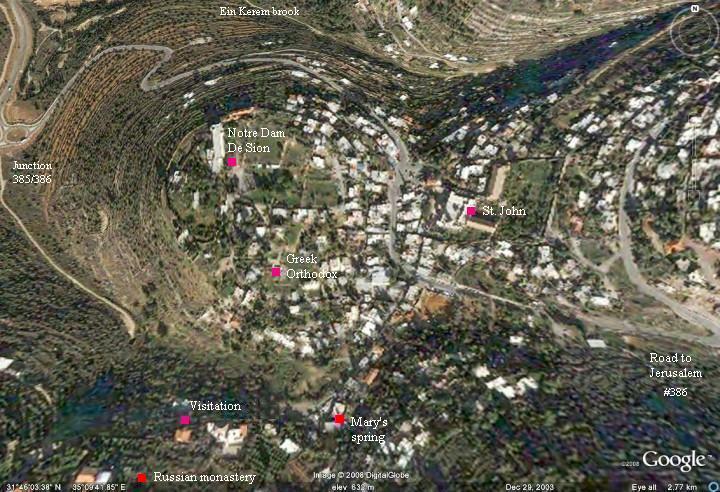 This aerial map shows the location of the convent, on the southern side of Ein Kerem. 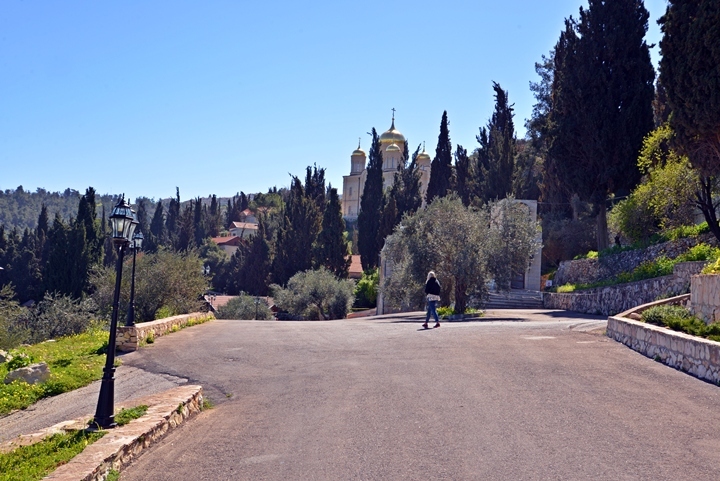 The entrance to the convent is through an inner road of the Hadassah hospital. 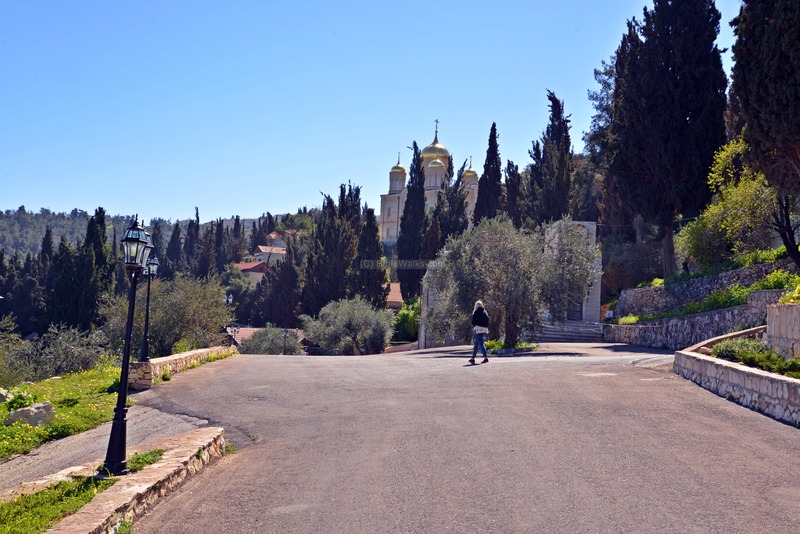 To reach the convent, drive outside of Ein Kerem to Hadassah; enter the main gate of the hospital, then follow the signs to the convent on its eastern side. Pointing and clicking on selected points in purple will automatically scroll to the relevant photo or site. 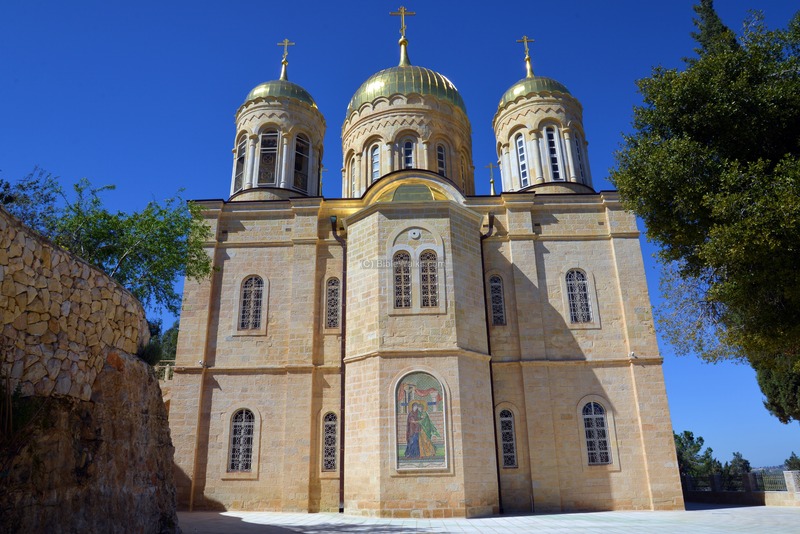 The Russian presence in the Holy Land was formed as the Russian Orthodox Ecclesiastical Mission in Jerusalem. It represented the Russian Orthodox Church in the Holy Land starting from 1847. The convent was established by the Russians in 1871, serving as a convent for nuns. It was named by the locals as Moskkubia (Al Moskovoia), after the capital of Russia (Moscow). It is named "the Gorny Convent", based on the Russian word meaning "mountainous". An old photo of nuns serving in the convent, dressed with traditional clothes of that time, is seen here. The structure with the 5 "onion style" domes started construction in 1905 and completed only in 2005. Later, its domes were painted in gold. The monastery is open to the public on limited visiting hours, and is recommended for the beautiful Church and the panoramic views of Ein Kerem. 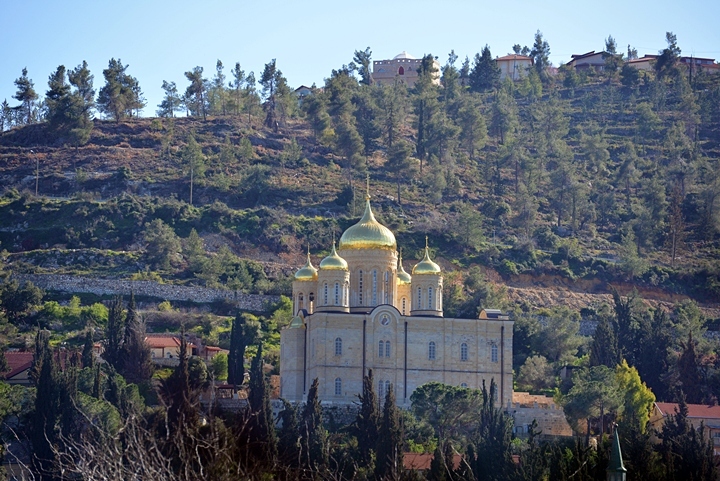 The Russian church, seen below, is located above the Visitation church, on the south side of Ein Kerem. The church is located inside the area of the Russian monastery called Moskkubia (Al Moskovoia). Around it are structures belonging to the Nunery. The convent is accessed from an inner road of the Hadassah Hospital. After passing the gate and entering the compound, a wide road leads eastwards towards the impressive Church in the center of the convent. 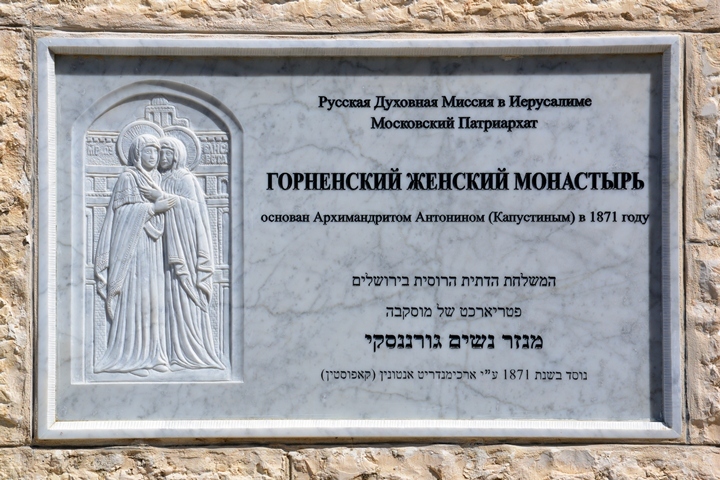 On the outer side of the gate is an inscription in Russian and Hebrew. The convent, according to the inscription, is named as the Women Gornenski ("mountainous") convent. It was established as part of the Russian Orthodox Ecclesiastical Mission in Jerusalem, which represented the Russian Church in the Holy Land starting from 1847. 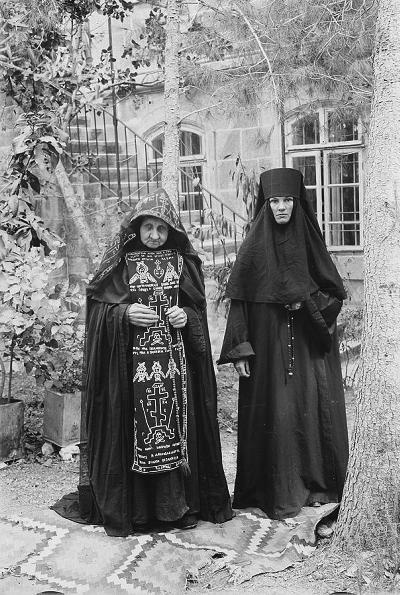 The convent was established in 1871 by the Archimandrite Antonin (Kapoustin). Andrew Kapoustin was a Russian Byzantologist, born in 1817. He was named Antonin after becoming a monk. In 1865 he became a chief of the Russian Orthodox Ecclesiastical Mission in Jerusalem. His title - Archimandrite is an Eastern Orthodox clergy with an honorific rank lower than a bishop, meaning "chief of a sheepfold". A number of the convent structures are located along and around the main road. The nuns who operate the convent mend and clean the roads and gardens. A steep staircase leads up from the access road to the Church. The entrance to the Church is located on the western side. 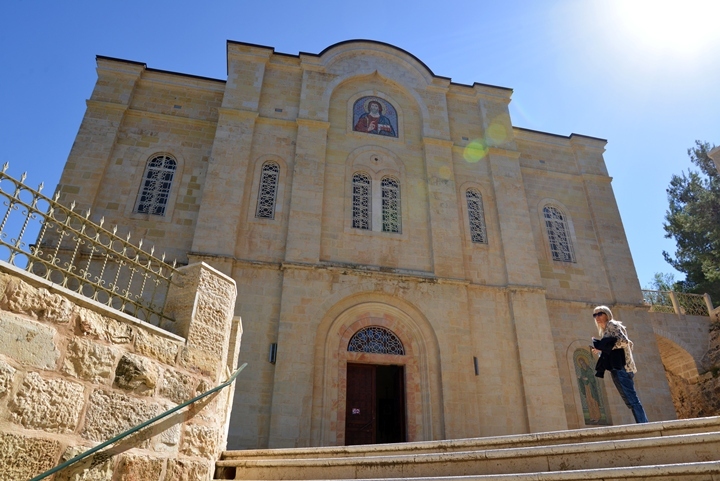 Visits to the interior of the Church are not permitted to the public, but the exterior is rewarding enough to justify the visit. 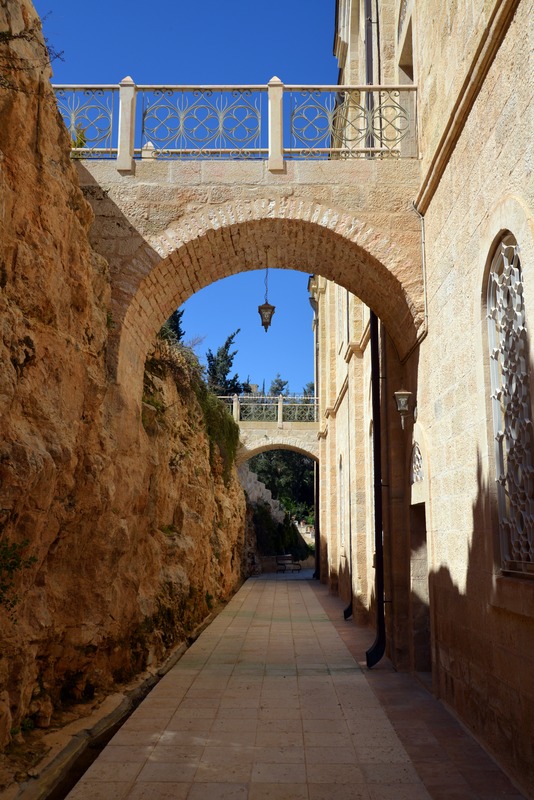 On the north side of the courtyard is a balcony with great views of Ein Kerem and the hills around Jerusalem. The main altar is on the east side, where three of the five golden domes are seen towering above the structure. A closer view of the central dome is seen below. 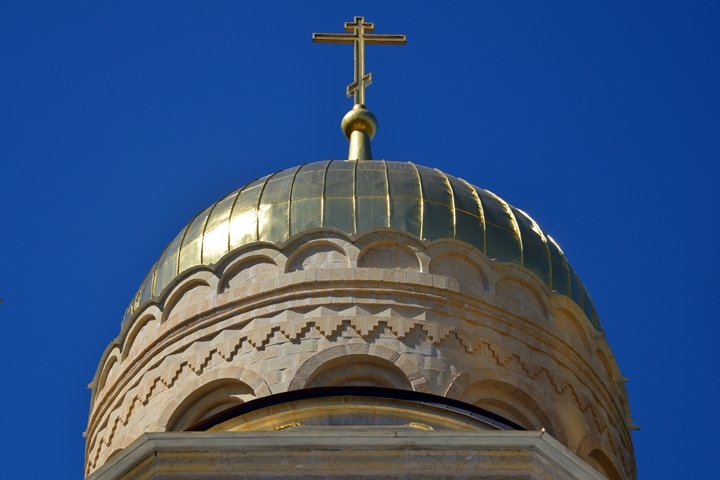 The styled cross above the dome is a symbol of the Russian church. Its lower bar is tilted, and symbolizes the two robbers that were crucified with Jesus (the top right side is the "good" robber). Another interpretation is that the lower bar is the footrest. Another small bar appears in the top side of the cross symbolizing the inscription over Jesus head. 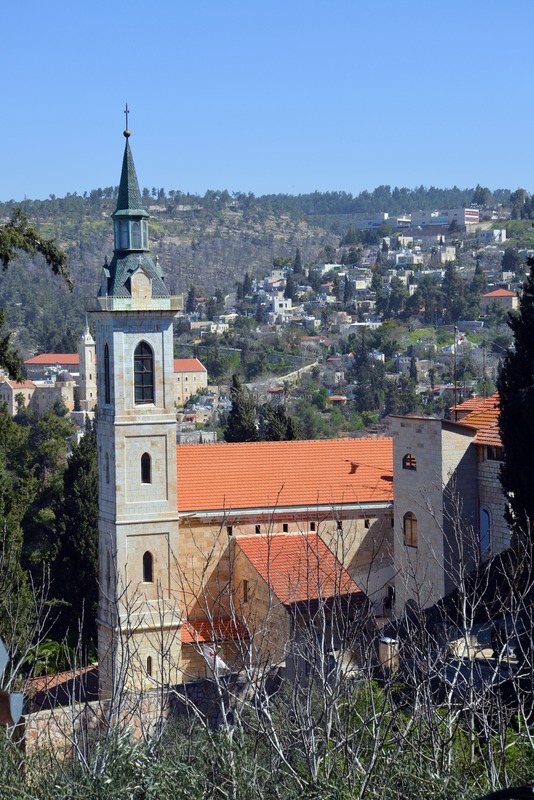 Virgin Mary's visited the summer house of the parents of John the Baptist, which according to tradition was located in Ein Kerem. 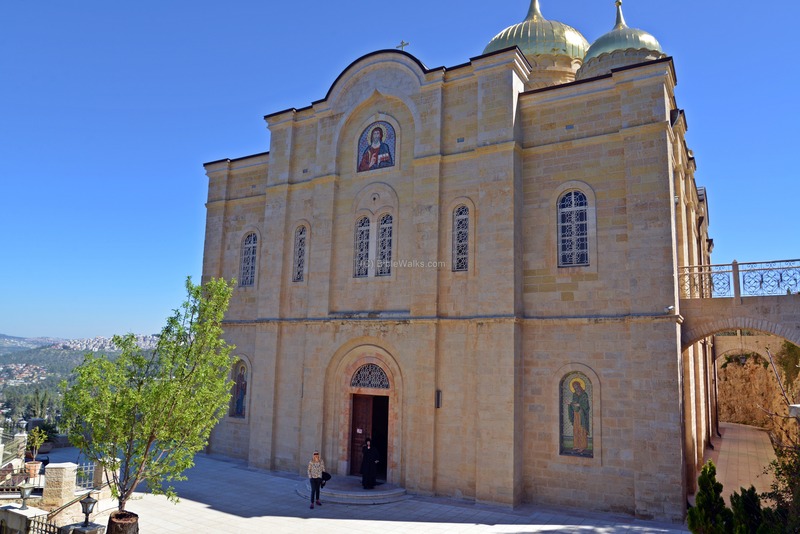 It is also the traditional birthplace of John the Baptist. 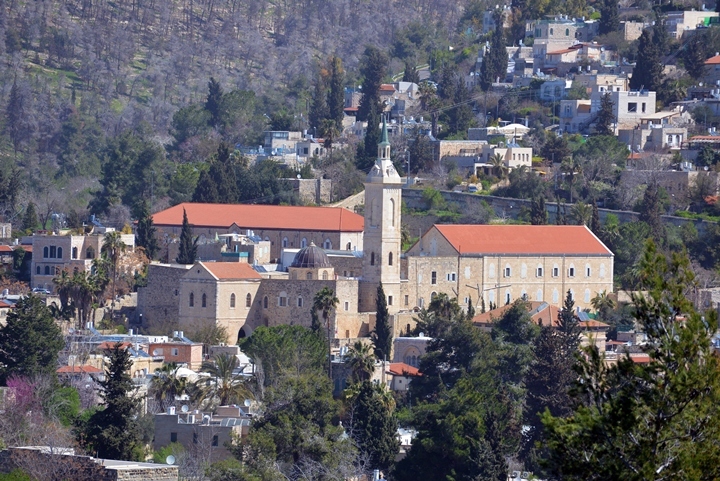 This meeting event is the main subject of the churches of Ein Kerem. 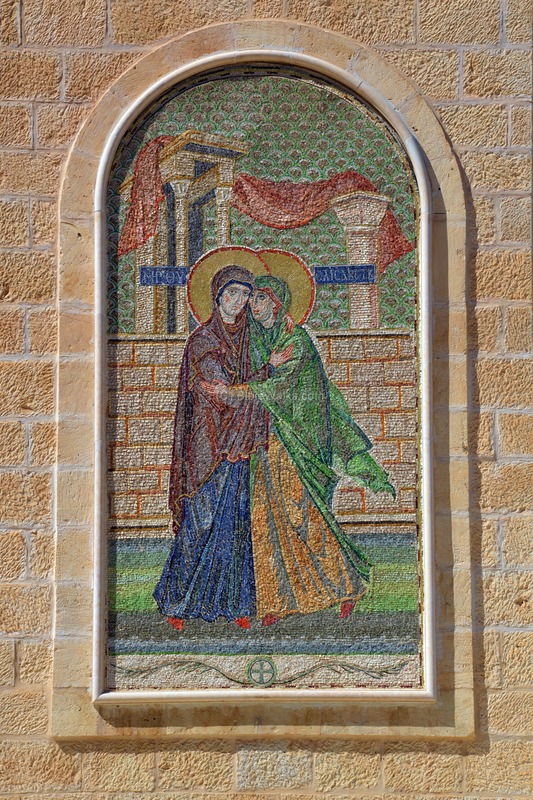 A mosaic painting of the meeting of Mary and Elizabeth are located on this eastern side, as shown below. The next photo shows the southern side of the Church. A bridge connects the second floor to the gardens. The convent is located above Ein Kerem, and offers great views of the sites of this enchanted village. This photo is of the visitation church. 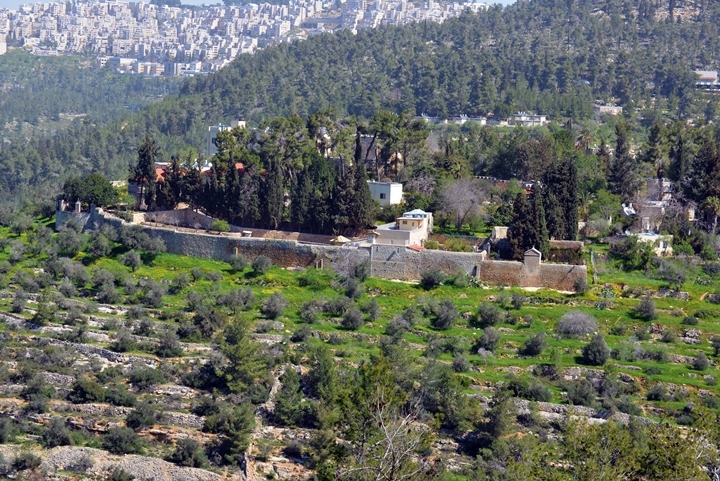 Behind it, farther north, is the monastery of St. John BaHaraim. The photo below is a closer view of the monastery and Church. On the west side of Ein Kerem is the walled monastery of the Sisters of our Lady of Zion. Gorney, Gorninski - Russian: mountainous. This is the Russian name of the village.